Good evening, friends. Tonight, an old Halloween’s eve, your world and magical world collide for but one night—the night filled with a little trick, little treat, and bit of Hocus Pocus. W: The Sanderson Sisters are back! M: We’re back! Back where, Winnie? W: Isn’t it obvious? We’re back in the living world. W: Yes, don’t you understand? We’re harnessed this magic found within this kingdom to return for but one night. W: And we shall make it a grand night - full of spellbinding tricks or treats. A night that will long be remembered! W: What is it, Mary? There so many of them and dressed funny. W: Fools! Of course, there are children. Excuse me, what year is it? I said what year is it? W: Sisters, it’s been 23 years since we last return. M: We’re getting better at this. W: Oh, that’s all Halloween’s eve, our favorite time of the year. M: Winnie, remember what happened last Halloween? S: We turned to dust. Dust! Dust! That’s why we have returned: to celebrate Halloween and throw most villainous Halloween party this kingdom ever seen. But we’ll need some help. S: I was thinking the same thing, dear sisters. S: Here we go, Winnie. W: Well done, sister Sarah. I knew I kept you around for a reason. Now, it’s time to get this party started. We will need a spell for the Hocus Pocus Party Potion. The spell. Sisters! Hand me the spell. W: What’s spell? The spell I ask you to hold onto to give it to me at a time like this. M: We can’t find it, Winnie. W: Why, Why have I been cursed with such sisters? W: And what’s it doing wrapped around Halloween chocolate? Enough, enough! We’ve lost enough time as is. Pray, tell. What is the first ingredient, Sarah? S: As dark as midnight, and as mysterious as the unknown. Winnie, where would we get shadows that sinister? W: And who are you? Also known as the Shadow Man. F: Now I hear you all in need of some sinister shadows. Well, you are in luck because ladies, I can deliver. W: And what makes you think we need your help? “Shadow Man”? Don’t you disrespect me little ladies. (He’s got friends on the other side! I got things I ain’t even tried! Won’t you shake the poor sinner’s hand? We got what we need! W: Wonderful! Our Hocus Locus party potion is coming together! S: Can we keep him? W: Focus! Now, Mary, What is the next dastardly ingredient? W: What is that—some type of horse? M: Wait, there was chocolate smudged over the words. Ah, there was chocolate, give me that, Mary. M: Do we need to hold a calming circles? W: Fools! There’s no time. Ingredient, read the ingredients! What, I’m just little old Oogie Boogie is all. You know, the shadow on the moon midnight filling dreams to the brim with fright! My dear. I’m the stuff to your worst nightmare. M: You see? He scared us and made our nightmare true and then you cried and I know I cried. W: Enough! We get it. Well, I, thank you Mr.Boogie. S: Can we keep him, too? Oh, sisters, it’s working. The Hocus Pocus party potion is working. Read me the last ingredient. W: Let me see that. "Frightful friends who add power to the potion after all a party is only as good as those you invite?" What is this?! M: It’s actually a very nice sentiment if you think about it. W: Nooo! Fools! We don’t have any friends. W: No, we’re sisters. I have to like you. This may be the end. I just wanted to throw the most villainous Halloween party this kingdom ever seen. Good bye, cruel. Bye bye cruel. Ma: My my, another party to which I wasn’t invited. Oh great one. If we had known you’d come, we would have invited you for sure. S: We are not worthy. M: Maleficent. She is greener than I thought. And those horns are huge? Ma: I will consider it but I oversight then, hmm? 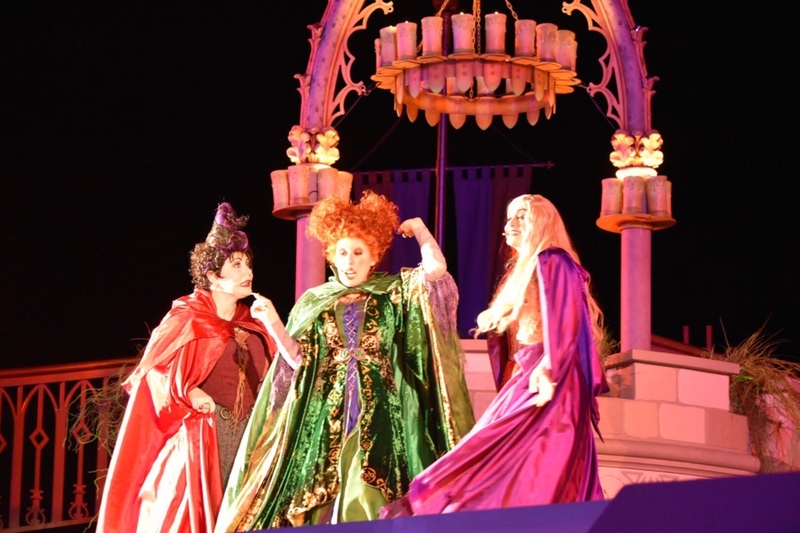 W: Perhaps, you could help us with our Hocus Pocus party potion so that we throw the most villainous Halloween party this kingdom ever seen, hmm? W: Oh, we were hoping, your excellency, that you might help us with our last ingredient. M: And that would be? S: Frightful friends! Frightful friends! Ma: Lore and legend are full of villainous fiends. I suppose for such an occasion. I could conjure a few. W: I knew we would see eye to eye. Ma: Listen well, all of you. If it is frightful friends that you request, each incantation calls forth a guest. Come now a queen by power and right. Bring poison apples and give us a fright. From the underworlds ungodly domain we call forth the ruler of death and disdain. Come and inspire with devious thoughts, a desire for furs all covered in spots. Impress us oh pirate from faraway land. Strike fear in our hearts with a hook for a hand. We invite and compel here a slithering snake with a sorcerer’s power to give but not take. Enter, good lady by thee we are graced. Though manners be proper they are but two-faced. W: I’ve never seen so many frightful friends in one place. M: Is this what it feels like to be popular? M: The potion is almost complete. And just missing one last thing. The hair of an innocent. No, none of you? Oh, I’ll be needing this. Thank you. The Hocus Pocus Party Potion is complete!! Thank you, it was nothing. S: But Winnie, what about them? W: Leave our not-so-scary friends to me. Hello, people! My name is Winifred, what’s yours? W: Now wasn’t that fun? Now go all of you, and run amok! S: We didn’t bring our brooms. W: So we shall walk. Now go forth, and party until the witching hour returns, Fare thee well, friends. Happy All Halloween’s Eve!